NFL Pick 'Em Week 11: Jerry Jones is Detrimental Edition: The NFL week begins tonight with an uncharacteristically good Thursday night game: The 6-3 Titans visit the 7-2 Steelers in what was once an AFC Central divisional game. In the SportsFilter NFL Pick 'Em, jjzucal keeps first place at 663 but rumple (646) and Howard_T (639) make up considerable ground. Rumple wins the week with 110. 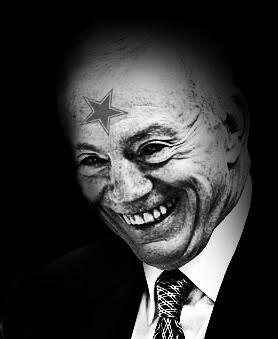 Make your picks, and be sure to factor in the possibility that Jerry Jones will lose his NFL franchise in Dallas. One pick made, 13 to go. Got the first one right, but I knew I should have locked it. No guts, no glory. I have the feeling this is going to be an ugly week. Conceded, but it's kind of true when a team can be mostly mediocre for 20 years and still rank No. 1 in TV ratings and self-declared fan popularity in many surveys. Heretic! The pentagram deserves respect. I'm no fan of Rowdy, whose proportions are weird and face kind of terrifying. But I can't call him the worst in a world where Boltman exists. NO! Drew is magic on the mike. I stand corrected ... there's Sammy the Shrimp at Southend United.